The grass is always greener on the other side of the geo-fence. Most shoppers are engaging with products and brands digitally, but the fact is — 90% of today’s shoppers are still buying in-store. So how can you leverage that online behavior to drive in-store outcomes? ownerIQ’s eGuide, Opening the Gate to Geo-Weighting, delves into popular Geo-Targeting techniques used to drive consumers in-store and explores why it’s time for such techniques to evolve. It’s time to change the Geo-Targeting game by revolutionizing the entire process of driving shoppers in-store. 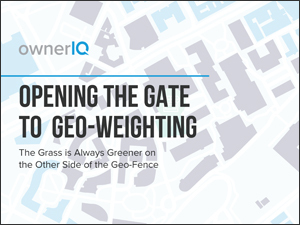 Download today to see why sometimes the grass is greener on the other side of the Geo-Fence.